But racing takes center stage. Drones aren't new to CES, but it's only in the last year or two that they got their own dedicated area in the convention hall. But, drones are meant to fly free, not behind netting, so some bright spark invented the Drone Rodeo: an annual off-site event where the latest and greatest in UAVs could do their thing as nature intended. The event is back this year, and once again it provided a pretty good snapshot of what's going to be hot in the drone world in 2017. The star of this year's show was undoubtedly UVify. I already got to meet with its team ahead of time, to try out its no-compromises racing drone called Draco. But there's only so much you can do in the parking lot of the Las Vegas Convention Center. A dedicated aerodrome for drones (which is where the rodeo was held) is an entirely different matter. I already talked about how the Draco was an exciting idea. A racing drone that can open the sport to a whole new audience is going to see many more pilots picking up the sticks. 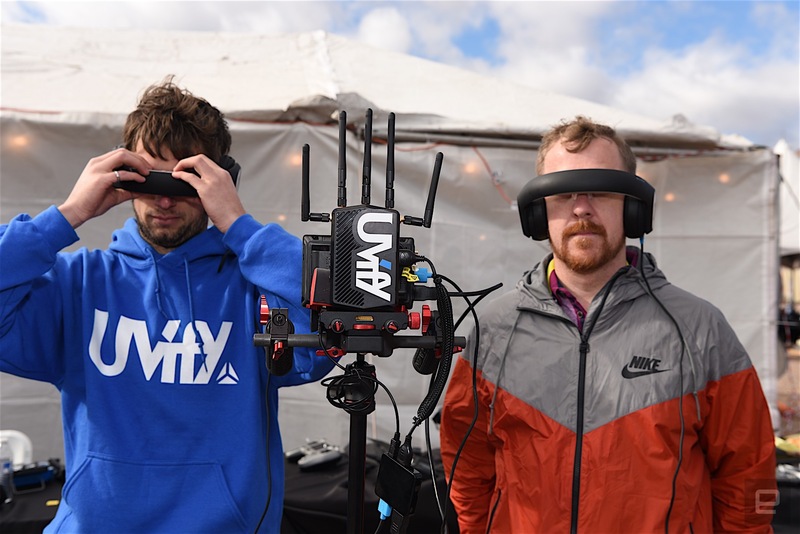 At the rodeo, I had the pleasure of "riding" along with UVify's pro pilot, and it's an incredible experience. By "riding," I mean I was wearing a pair of video goggles with a live feed in real time from the drone's camera. Imagine backflips, barrel-rolls and nose-dives, all at breakneck speed. It's like being on an invisible rollercoaster, except you're just... standing there. My flight was also notable for the company, as it was the first time Unify demoed its flagship Draco HD to any media. Unlike most racers, the Draco HD transmits digital video on 720p, not the usual lower-resolution analog stream. The result, unsurprisingly, is a much crisper, larger feed beamed right into your eyes (via the excellent Avegant Glyph). For budding drone pilots, and old timers alike, this should be exciting, as one of the most fun parts about flying, whether racing or otherwise, is enjoying the sensation of soaring like a bird that these video feeds provide. Better-quality feeds might require a bit more technology on the drone itself, but that's only going to become easier and more common if companies like UVify lead the way. Further highlighting the importance of FPV (as it's called) was Epson. The company has been looking for a use for its Moverio AR glasses since it launched them a few years ago. 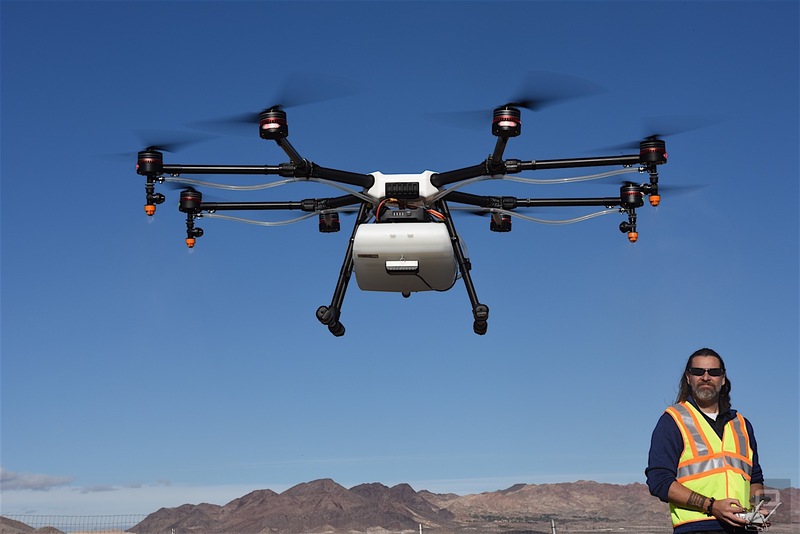 The brand's latest model, the BT-300, is finding it spiritual home with FPV drone flying. So much so that Epson has collaborated with DJI on a drone-specific version, imaginatively titled the "Drone Edition." By working directly with DJI, Epson was able to achieve goggles that are better tailored to flying than the standard model. The BT-300 glasses are actually see-through (rather than taking the form of a heads-up display). At the same time, they use an augmented reality overlay to place a small, transparent live-feed from the drone's camera in your view. The benefit of the AR approach is that you can keep an eye on the drone itself while lining up the perfect shot for the camera. It's a neat trick. The Drone Edition also has tinted lenses to help with visibility outside in the sun. I'll be honest: I tried them and didn't immediately get on with them. I've flown using more typical video goggles, with a bright, clear feed from the drone. I've also flown just line-of-sight. The BT-300 Drone Edition doesn't offer the best of either, with the tint making it harder to spot the drone. That said, the core idea is clever and a good use of Epson's existing technology. I was also given a demo of another mode, where instead of showing the camera feed from the drone, green markers showed where a drone with a pre-programmed flight would go. This seemed to me like a much more immediately accessible use of the goggles, and I'm sure the company is already working on more applications. Aside from goggles and racing, 3D printing store Sculpteo was showing off its drone-specific marketplace. It's designed for clumsy pilots (like me) who occasionally bring their craft down to the ground with a bump, or break parts other ways. The idea being, instead of buying an official part from a manufacturer, which could take a few days to get to you, you could print off a few temporary spares in advance, so you don't need to stop flying should you break anything. The takeaway from the day was clear: Racing is crossing over, FPV is a key technology to both engage new pilots and assist the established ones, and services like Sculpteo's should help all of us stay up in the air. At least a little bit longer, anyway.